Chandra X-ray image (Gaensler et al. 2002) of the region around the MSH 15-5 2 remnant (also known as G320.4-1.2). At the center the 150 ms X-ray, gamma and radio pulsar PSR B1509-58, surrounded by an X-ray nebula, from which a jet appears to emerge. 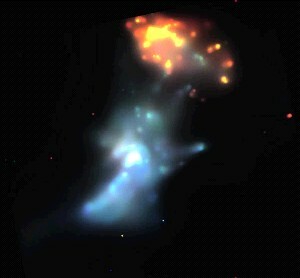 The structure in the upper half of the image, also known as the optical nebula RCW 89, forms part of the supernova shell, which is better visible in radio images. The supernova remnant MSH 15-5 2 was first discovered in radio observations, and forms a rather complex object. Radio observations (Caswell et al. 1981) reveal a roughly circular supernova shell 30′ in diameter with a bright feature in the North-West rim and a fainter one in the South-East. A the center of the shell, Seward & Harnden (1982) discovered a 150 ms X-ray pulsar, termed PSR B1509-58, obviously left over after the supernova explosion. The age of the pulsar is estimated to about 2000 years; it is roughly 5 kpc away from Earth. The pulsar is surrounded by a diffuse nebula of unpulsed X-ray emission, clearly seen in ROSAT observations (Trussoni et al. 1996). This pulsar wind nebula is generated by electrons accelerated in the vicinity of the pulsar, streaming away and generating a "pulsar wind termination shock", similar to what is observed in the Crab nebula.The ROSAT data already hinted a jet-like structure emerging from the pulsar, beautifully confirmed by Chandra data (see image above by Gaensler et al. 2002). In addition to this collimated outflow - most likely along the pulsar spin axis - the image shows arc-like structures North of the pulsar. Interpreted as synchrotron emission from electrons, the X-ray results suggest the presence of electrons accelerated up to energies of tens of TeV, possibly leading to VHE -ray emission through an inverse Compton (IC) process (du Plessis et al. 1995). Early observations with the CANGAROO telescope (Sako et al. 2000) yielded a marginal TeV gamma-ray signal. With the H.E.S.S. four-telescope system, 22 h of data were accumulated on MSH 15-5 2, showing a very clear TeV gamma-ray signal with a significance of 25 sigma and a flux of roughly 15% of the flux observed for the Crab Nebula. A surprise was that the TeV gamma rays show a clearly resolved structure (Fig. 1), with an elongated and slightly curved emission region, resembling in its morphology the X-ray jet. In the north-west direction, the source has a characteristic width of 6' (assuming a Gaussian source profile) (Fig. 2), in the orthogonal direction a width of about 2', The center of gravity of the gamma-ray emission is displaced from the pulsar. The lack of symmetry, both in the X-rays and gamma rays, implies either a single-sided outflow from the pulsar, or could be the result of beaming in two jets, which suppresses emission from a possible counterjet; however, the mechanisms responsible for the emission of a high-speed jet (or jets) from the pulsar are not understood. The fact that the overall morphology is similar in X-rays and gamma rays demonstrates that the features seen in X-rays reflect the distribution of high-energy electrons rather than a peculiar structure of magnetic fields. X-ray and gamma-ray spectra can be described as resulting from a single population of electrons, radiating in a 17 microGauss magnetic field and scattering infrared photons and starlight photons to TeV energies in the Inverse Compton process (Fig. 3). Obviously, MSH 15-5 2 provides an ideal laboratory for study of the complex processes in the vicinity of pulsars, and their interaction with the ambient medium and radiation fields. Fig. 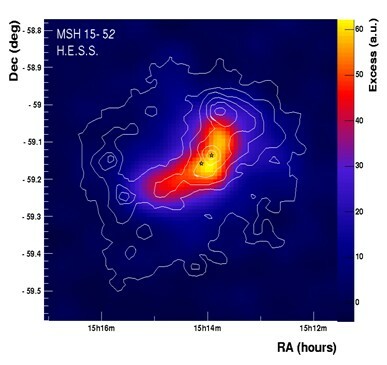 1: Smoothed TeV gamma-ray map of MSH 15-5 2 as seen with H.E.S.S.. The white contours indicate the X-ray flux (Trussoni et al. 1996). The upper star shows the location of the pulsar, the lower the center of gravity of the TeV gamma-ray emission. Fig. 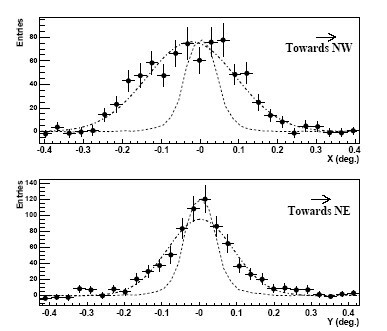 2: Profile of the TeV gamma-ray emission along the North-West direction (along the jet axis) and along the perpendicular North-East direction. The TeV emission profile is wider than the instrumental resolution (narrow dotted peaks), and appears shifted with respect to the pulsar. Fig. 3: The energy spectrum of gamma rays follows a power law, dN/dE ~ E-2.27, over two decades in energy. 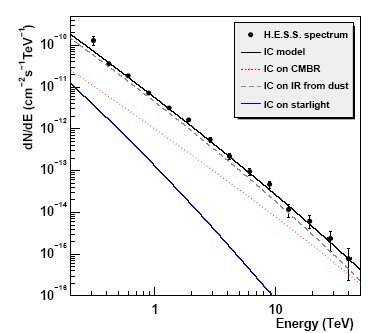 The lines show a model fit to the X-ray and TeV gamma-ray data, where electrons generate X-rays by synchrotron radiation in a 17 microGauss magnetic field, and gamma rays by upscattering of infrared photons emitted from interstellar and of starlight photons.